Having been employed on the combined Tarbert-Portavadie and Lochranza sailings since late October, CalMac's LOCH TARBERT is seen here arriving at Tarbert, Loch Fyne. In the background, Tarbert pier, which was threatened with closure last summer, appears to have been given a partial reprieve. Once again, it features on four occasions in the newly released timetable for the paddle steamer WAVERLEY's forthcoming summer schedule (PDF file) of Clyde cruises. 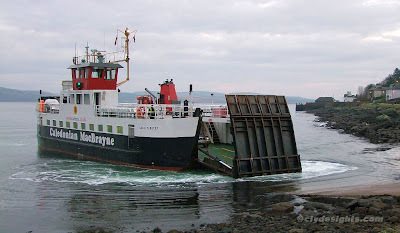 LOCH TARBERT will complete her stint of duty on this service in the next couple of weeks, when LOCH RIDDON is due to return to the route for the remaining period of the winter timetable.